How does research productivity relate to gender? Talk (with Justus MK Rathmann) with conference paper at BigSurv18, Barcelona (Spain), 24 October 2018. Talk (with Hayfat Hamidou) with conference paper at the Community in Crisis? workshop, Friedrichshafen (Germany), 13 October 2018. But aren’t you migrants as well?! How national and ethnic identities affect immigrants‘ out-group attitudes towards the majority population and other migrant groups. Talk (with Hayfat Hamidou) with conference paper at the ECPR General Conference, Hamburg (Germany), 25 August 2018. Alike at the core, different at the margins? Explaining party preferences of immigrant voters. Talk with conference paper at the EPSA Annual Conference, Vienna (Austria), 21 June 2018. Established models or migrant-specific factors? Explaining party preferences of immigrant voters. Talk (with Dennis Spies) with conference paper at the Jahrestagung des Arbeitskreises Wahlen und politische Einstellungen der DVPW, Berlin (Germany), 25 May 2018. What affects the voting behaviour of Germans of Turkish descent? Invited talk (with Dennis Spies) at the Foreign Office, Berlin (Germany), 23 May 2018. The role of discrimination and identification – Results of the Immigrant German Election Study. Invited talk at the Friedrich-Ebert-Stiftung, Berlin (Germany), 14 April 2018. Immigrant Voters against their Will? Talk and conference paper at the MPSA General Conference, Chicago (USA), 5 April 2018. Gender Differences in Research Productivity. Talk (with Justus Rathmann) at the German Centre for Higher Education Research and Science Studies (DZHW), Berlin (Germany), 20 February 2018. Sampling Procedure of the Immigrant German Election Study. Invited talk at the GESIS Workshop on Methodological Issues in Surveying Immigrant Populations, Cologne (Germany), 13 November 2017. First Results of the Immigrant German Election Study. Talk at the Mittagsforum, Duisburg (Germany), 26 July 2017. The Effects of Interviewer Characteristics on Political Knowledge. Talk at the 7th Conference of the European Survey Research Association (ESRA), Lisbon (Portugal), 18 July 2017. The ‚Most German’ Voters? A Focus Group Analysis of Identities, Political Issues and Allegiances to the Right among Ethnic Germans from the Soviet Union. Talk and conference paper (with Achim Goerres and Dennis Spies) at the Conference of the Council for European Studies, Glasgow (UK), 13 July 2017. The Immigrant German Election Study. Talk at the UDE Diversity Day, Essen (Germany), 30 June 2017. The Determinants of Multiple Party Identifications. Talk and conference paper (with Martin Schultze) at the Annual Conference of the EPSA, Milan (Italy), 22 June 2017. The Common Grounds of Party Adherence. Talk (with Jasmin Fitzpatrick) at the Jahrestagung des Arbeitskreises Wahlen und politische Einstellungen der DVPW, Frankfurt (Germany), 18 May 2017. Talk at the annual meeting of the Sektion „Methoden der Politikwissenschaft“, Mainz (Germany), 12 May 2017. Effekte des spezifischen politischen Wissens auf die Qualität der Wahlentscheidung. Eine Untersuchung am Beispiel der österreichischen Nationalratswahl 2013 (Effects of specific political knowledge on the quality of vote choice. Evidence from Austria). Talk and conference paper (with David Johann), Workshop on Political Knowledge, Marburg (Germany), 17 March 2017. Research Design and Sampling Procedure. Talk at the first Workshop of the Immigrant German Election Study, Duisburg (Germany), 3 March 2017. Gender-based differences in German-language publications. Poster presentation at the 21st International Conference on Science and Technology Indicators, Valencia (Spain), 16 September 2016. Trends and Developments in Multi-authorship in five Social science disciplines from 1991 to 2014. Talk at the 21st International Conference on Science and Technology Indicators, Valencia (Spain), 15 September 2016. The Contents of Party Identification. Talk and conference paper at the ECPR Graduate Conference, Tartu (Estonia), 12 July 2016. Die Wahlentscheidung mehrfacher Parteianhänger (The voting decision of multiple party adherents). Talk and conference paper at the Jahrestagung des Arbeitskreises Wahlen und politische Einstellungen der DVPW, Landau (Germany), 3 June 2016. Talk and conference paper at the EPSA General Conference, Vienna (Austria), 26 June 2015. How Do Inter-party Hostilities affect Vote Choice in Europe? Talk and conference paper at the EPSA General Conference, Vienna (Austria), 25 June 2015. Negative Party Evaluations and their Effects on Vote Choice in Europe. Talk and conference paper at the MPSA General Conference, Chicago (USA), 16 April 2015. Talk at the Sixth Düsseldorf Graduate Conference on Party Research, 07 February 2015 (with Martin Schultze). Konzeptualisierung und Operationalisierung der Parteiidentifikation auf Basis des Ansatzes sozialer Identität (The conceptualization and operationalization of party identification within the social identity approach). Talk and conference paper, Authors’ conference for the special issue “Political Psychology” of the Politische Vierteljahresschrift 2015, Mainz (Germany), 27 September 2014. Negative Partisanship as Outgroup Derogation – Effects on Political Attitudes and Voting Behaviour. Talk and conference paper, ECPR General Conference, Glasgow (UK), 6 September 2014. Exploring the Contents of Collective Identity of Party Adherents – Some Thoughts and their Application. Conference paper (with Jasmin Fitzpatrick), ECPR General Conference, Glasgow (UK), 6 September 2014. The Contents of Party Identification – A Qualitative Approach. Talk and conference paper (with Jasmin Fitzpatrick), ECPR Graduate Conference, Innsbruck (Austria), 03 July 2014. 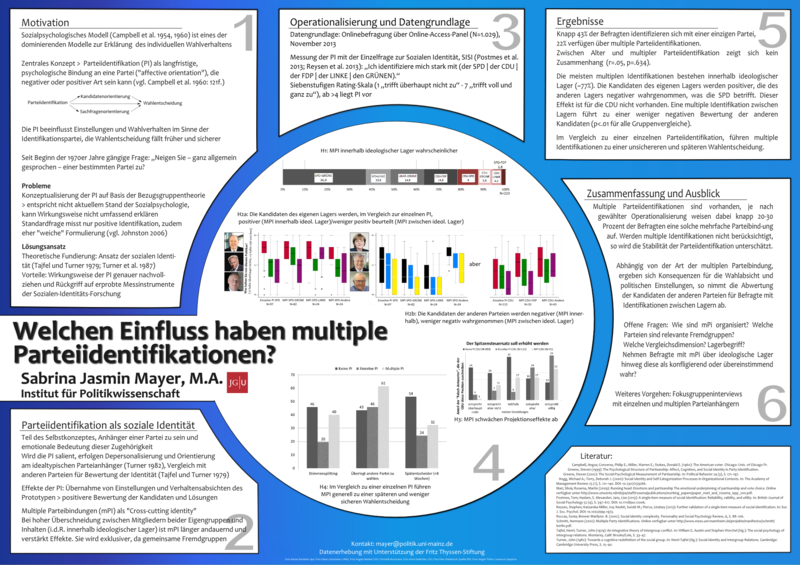 Poster presentation at the conference “Die Bundestagswahl 2013″, Berlin (Germany), 06 June 2014. Negative Parteibindungen und ihre Konsequenzen (Negative partisanship and its consequences). Talk at the Fifth Düsseldorf Graduate Conference on Party Research, 07 February 2014. How multiple party identifications shape the voters’ political view. Talk and conference paper, ECPR General Conference, Bordeaux (France). 07 September 2013. Die theorieadäquate Messung der Parteiidentifikation (The theory adequate measurement of party identification). Talk at the Fourth Düsseldorf Graduate Conference on Party Research, 08 February 2013. I'm now formally a management committee member of the CA16111 and looking forward to contribute! New peer-reviewed contribution on the meaning of partisanship for young voters with Jasmin Fitzpatrick to an edited volume is going to be published soon!